A few months ago I demonstrated how to install the Keras deep learning library with a Theano backend. In today’s blog post I provide detailed, step-by-step instructions to install Keras using a TensorFlow backend, originally developed by the researchers and engineers on the Google Brain Team. I’ll also (optionally) demonstrate how you can integrate OpenCV into this setup for a full-fledged computer vision + deep learning development environment. The first part of this blog post provides a short discussion of Keras backends and why we should (or should not) care which one we are using. From there I provide detailed instructions that you can use to install Keras with a TensorFlow backend for machine learning on your own system. It’s important to start this discussion by saying that Keras is simply a wrapper around more complex numerical computation engines such as TensorFlow and Theano. When it comes to Keras you have two choices for a backend engine — either TensorFlow or Theano. Theano is older than TensorFlow and was originally the only choice when selecting a backend for Keras. So why might you want to use TensorFlow over a different backend (such as the no-longer-being-developed Theano)? The short version is that TensorFlow is extremely flexible, allowing you to deploy network computation to multiple CPUs, GPUs, servers, or even mobile systems without having to change a single line of code. This makes TensorFlow an excellent choice for training distributed deep learning networks in an architecture agnostic way, something that Theano does not (currently) provide. To be totally honest with you, I started using Keras well before TensorFlow was released (or even rumored to exist) — this was back when Theano was the only possible choice of backend. I haven’t given much thought to whether Theano or TensorFlow should be my “go to” backend. Theano was working well for what I needed it for, so why bother switching? Figure 1: I polled my Twitter followers (@pyimagesearch) to determine whether they preferred using Theano or TensorFlow as their Keras backend. 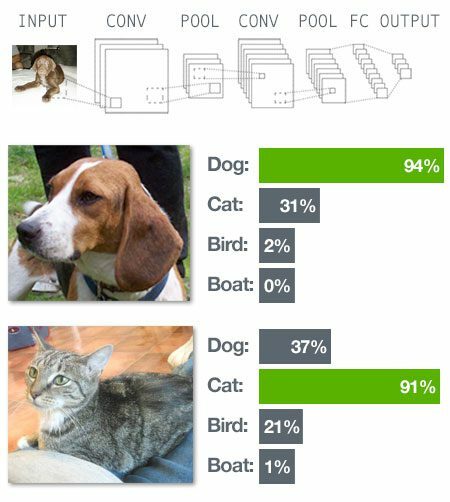 67% of respondents said they were using TensorFlow as their backend. I was honestly quite surprised. How, as a long-time Keras user, could I possibly be in the minority? 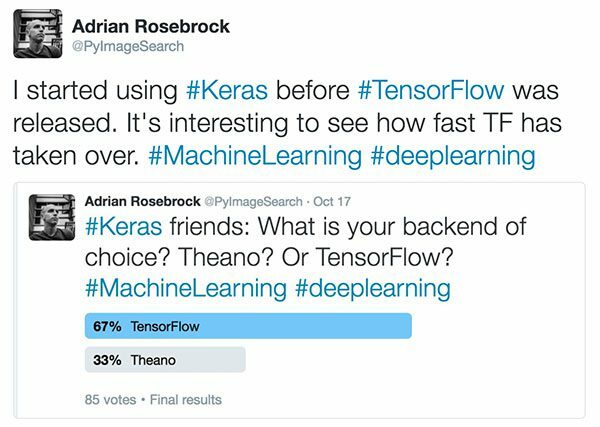 This 67% of respondents might be swayed since TensorFlow is now the default backend when installing Keras…or it could be because many of my followers are finding TensorFlow a better, more efficient backend (and using more TensorFlow specific features). Regardless of the exact reasoning, there is one thing you cannot dispute: TensorFlow is here to stay. 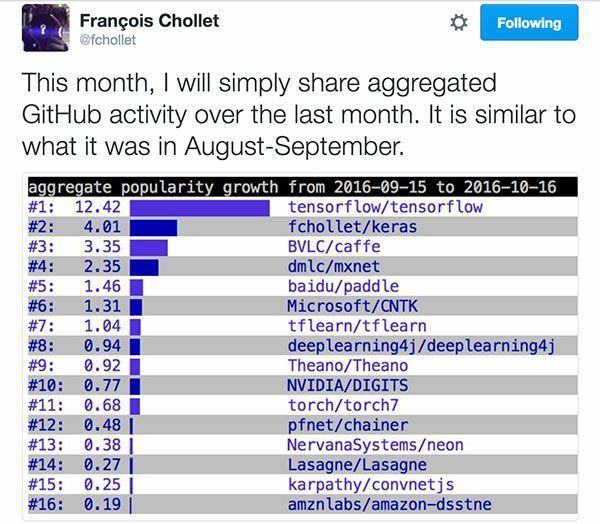 Figure 2: TensorFlow tops the charts as the deep learning library with most GitHub activity. Keras follows at #2 with Theano all the way at #9. As we can see, TensorFlow is topping the charts by a mile (#1) with Theano at #9. While Keras makes it simple for us to switch backends (all we need to do is install our respective backends and edit a simple JSON configuration file), we still need to be mindful of what the trends are telling us: that TensorFlow will continue to be the preferred Keras backend in the (near) future. Update 2018-06-04: Theano is no-longer being actively developed (announcement 2017-09-29) and as you guessed it, TensorFlow is now the default. If you’ve ever read any of my previous tutorials (whether for OpenCV, CUDA, Keras, etc.) you’ve likely picked up on the fact that I’m a huge fan of using Python virtual environments. I especially recommend Python virtual environments when working in the deep learning ecosystem. Many Python-based deep learning libraries require different versions of various dependencies. For example, if you wanted to use Keras + Theano together you would need the latest version of Theano (i.e., their latest GitHub commit, which isn’t always the version published on PyPI). However, if you wanted to try a library such as scikit-theano you would need a previous version of Theano that is not compatible with Keras. The dependency version issue only compounds as you start to add in other Python libraries, especially deep learning ones (such as TensorFlow), which are volatile in their very nature (since deep learning is a fast-moving field with updates and new features being pushed online every day). I won’t go into a huge rant on the benefits of Python virtual environments (as I’ve already done that in the first half of this blog post), but the gist is that by using Python virtual environments you can create a separate, sequestered Python environment for each of your projects, ensuring that each Python environment is independent of each other. Doing this allows you to totally and completely avoid the version dependency issue. I’m going to assume that you have both virtualenv and virtualenvwrapper installed on your system (if not, both are pip-installable and require only a small update to your shell configuration; just follow the links above for more information). I’ll name this virtual environment keras_tf for Keras + TensorFlow (I also have a virtual environment named keras_th for Keras + Theano). Again, while this is an optional step, I really encourage you to take the time to properly setup your development environment if you are even remotely serious about doing deep learning research, experiments, or development using the Python programming language — while it’s more work upfront, you’ll thank me in the long run. Figure 3: Installing TensorFlow for deep learning via pip into my Python virtual environment. That’s it! 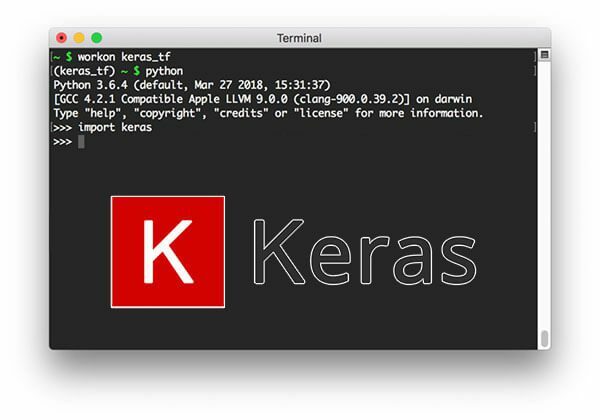 Keras is now installed on your system! Before we get too far we should check the contents of our keras.json configuration file. You can find this file in ~/.keras/keras.json . Specifically, you’ll want to ensure that image_data_format is set to "channels_last" (indicating that the TensorFlow image dimension ordering is used rather than "channels_first" for Theano). You’ll also want to ensure that the backend is properly set to tensorflow (rather than theano ). Again, both of these requirements should be satisfied by the default Keras configuration but it doesn’t hurt to double check. Make any required updates (if any) to your configuration file and then exit your editor. You might be wondering what exactly image_data_format controls. Using TensorFlow, images are represented as NumPy arrays with the shape (height, width, depth), where the depth is the number of channels in the image. However, if you are using Theano, images are instead assumed to be represented as (depth, height, width). This little nuance is the source of a lot of headaches when using Keras (and a lot of if statments looking for these particular configurations). Ensure your image dimension ordering matches your backend. If you see any errors when importing keras go back to the top of this section and ensure your keras.json configuration file has been properly updated. This step is entirely optional, but if you have OpenCV installed on your system and would like to access your OpenCV bindings from a Python virtual environment, you first need to sym-link in the cv2.so file to the site-packages directory of your environment. You’ll want to look for the global install of OpenCV which is normally in the /usr/local/lib directory if you built OpenCV from source (unless you specified a custom OpenCV install directory). Note: The other cv2.so files returned by my find command are simply sym-links back to the original cv2.so file in /usr/local/lib . Again, this step is totally optional and only needs to be done if you want to have access to OpenCV from inside the keras_tf virtual environment. If you get an error message related to OpenCV not being found then you’ll want to double check your sym-link and ensure it is pointing to a valid file. Figure 4: Learn how to utilize Deep Learning and Convolutional Neural Networks to classify the contents of images inside my book, Deep Learning for Computer Vision with Python. Starting with this tutorial on creating a simple neural network with Python and Keras. From there, try training your first Convolutional Neural Network (LeNet) for handwritten digit recognition. You might also be interested in trying this example on using pre-trained CNN architectures on the ImageNet dataset to recognize 1,000 different common object categories. Finally, I would also recommend taking a look at my book, Deep Learning for Computer Vision with Python. Inside the book there are over 900 pages covering: Neural Network fundamentals, practical examples, and state-of-the-art classification and object detection networks. Click here to grab your copy of DL4CV! In today’s blog post I demonstrated how to install the Keras deep learning library using the TensorFlow backend. When it comes to choosing a backend for Keras you need to consider a few aspects. The first is the popularity and therefore the probability that a given library will continue to be updated and supported in the future. In this case, TensorFlow wins hands down — it is currently the most popular numerical computation engine in the world used for machine learning and deep learning. Secondly, you need to consider the functionality of a given library. While Theano is just as easy to use as TensorFlow out-of-the-box (in terms of Keras backends), TensorFlow allows for a more architecture agnostic deployment. By using TensorFlow it becomes possible to train distributed deep learning networks across CPUs, GPUs, and other devices all without having to change a single line of code. Since Theano development has officially ceased in September 2017, I have fully switched to TensorFlow and I’m not looking back. If you enjoyed this install tutorial and found it helpful be sure to leave a note in the comments! And if you would like to receive email updates when new blog posts are published on the PyImageSearch blog, please enter your email address in the form below. Thank you, thank you. This post is both eye-opening and helpful. Thank you Adrian!! Now I’m much more prone to try and play around with deep learning!! I’m running OSX 10.11.6 with xcode-8.1 and using pyenv to create virtual environments. fails to import. There is an odd import error to do with a swig-created _pywrap_tensorflow module that it can’t find. In the meantime I managed to follow along but using python-3.5.2 instead. Thanks for sharing Chris. I’m not sure about this error message. If you haven’t already, I would suggest opening an Issue on the official TensorFlow/Keras GitHub. It’s always handy to hear from you. It is my absolute pleasure to learn from your tutorials. Please make tutorials for deep machine learning as you did for OpenCV python…! I’ll absolutely continue to do deep learning/machine learning tutorials on the PyImageSearch blog. There are a number of them already that were published within the past 2-3 months. I’ll also be announcing an actual deep learning book in December. I am getting started on this right away. Thanks for clear instructions as always. Would the following scenario classify for a Machine learning/Neural Net + Computer Vision Combo? Programmatically, I need to be able to identify a specific region in a video. Say, for example, the led displays on the perimeter of a Soccer game , or say the Giant overhead LED in a NBA game. Would I be able to achieve this with NN/ML/DL+CV combo? Or would this be just a pure CV effort where NN/ML/DL has probably no role to play? Would you care to share your thoughts? I could traditional computer vision + machine learning along with deep learning being used to solve this problem. I think either would work, it mainly just depends if your camera is static or if you’ll be capturing images from a large variety of viewing angles. Keep in mind that DL methods require a lot of training data so regardless of which way you go, make sure you collect a lot of data to work with. It’s a very helpful topic. Thank you Adrian. The only problem with TF is its installation on windows that its quite nontrivial unlike the Theanos one. I haven’t used Windows in a very long time — that’s good to know. My biggest complaint with TensorFlow is that it allocates the entire GPU memory to the process that spawned it rather than only allocating the necessary GPU memory like Theano does. Guys, there is a pecularity regarding installing TF version > 0.10 with keras. You have to set image_dim_ordering in keras.json to “th” even though you are using TF! Caused me immense headache while setting up TF on AWS. Hey CK — I just spun up an AWS instance three days ago and didn’t run into this particular issue. I’ll be sure to make note of it though. Great tutorial! Love the stuff you have been doing with Deep Learning! Just to add that I had a problem using virtualenv for some reason – scipy did not install properly. but using anaconda and an conda environment worked perfectly so that is a viable alternative. I want to ask your advice if tensorflow and keras are optimal solutions for a face recogntion ? In reality, it depends. For some datasets you can get away with Eigenfaces, Fisherfaces, or LBPs for face recognition. More advanced solutions should use OpenFace directly instead of trying to code a custom face recognition network. If I am already had the virtual environment for OpenCV, can I just install/use the keras in it? Yes, you can certainly use a pre-existing virtual environment provided there aren’t any package conflicts. If your previous one was just for OpenCV I don’t expect there to be any. Thanks for the guide Adrian! I managed to configure keras (keras.json) depending on virtualenv, this manner I can use keras with Theano or Tensorflow via virtualenv. Awesome, thanks for sharing Zauron! First of all, this post was really helpful to install keras with tensorflow!! Now, I installed keras with tensorflow and theano. And starting “workon keras_th”, when I import keras in python, this worked as theano backend, eventhough I implemented it on ‘keras_tf’. Do I need to change the kears.json file setting? If I have to, why do we use virtualenv? I thought by using virtualenv, when i execute ‘keras_tf’ and import keras, it works as tensorflow backend, and when i execute ‘keras_th’ and import keras, it works as theano backend . You use virtual environments so you don’t have conflicting library versions. However, since Keras relies on configurations outside the virtual environment you will need to update your keras.json file if you want to switch between Theano and TensorFlow. An alternative would be to create a hook that automatically swaps your keras.json file when you run the workon command. I’ve followed your post and completed to install keras with tensorflow. But, after I closed the terminal and start a new one. then, I tried to use ‘workon keras_tf’, but it said ‘workon: command not found’…. Is there something I have to do before using it? It sounds like your ~/.bash_profile (or similar profile file) was not updated correctly when you installed virtualenv and virtualenvwrapper. Which operating system are you using? Awesome Adrian!. You give the best tutorials. Thanks Raghunandan — I’m happy you enjoyed the tutorial! I have already installed GPU support TensorFlow in my system in docker. I can use tf in jupyter notebook. Do I need to install tf in my virtual environment again? Yes, each virtual environment is 100% independent from your system install — that is the way virtual environments are designed to avoid library versioning issues. Simply install TensorFlow into your virtual environment. Hello Adrian, in my case, after installation of keras I can see the file ~/.keras/keras.json is empty instead of above mentioned default content. Is there anything wrong? I used just onething different from you like I used different TF_BINARY URL for my system ubuntu 16.04 gpu .. Awaiting for your response. Fire up a Python shell and import the Keras library. This should populate the .json configuration file. I have a question. Why use tf as the backend and not use it directly? What is the advantage of using keras? Keras acts as a wrapper around Theano/TensorFlow and makes it much easier to write code to build CNNs while still retaining the optimizations and speed that Theano and TensorFlow give you. Thanks again for your post, very insightful. I am using AWS EC2 (p2.xlarge) to run Keras via Anaconda. I have installed all the correct drivers for the K80 GPU, somehow when I run my model, it’s still defaulting to use the CPU and was wondering if you happen to know if there’s a setting I can use to switch to always use GPU when running the Tensorflow backend? I am getting this error could someone please help me to remove it. Which version of Keras are you using? Is it >= 2.0? If so, make sure you install TensorFlow >= 1.0. Uninstall both tensorflow and protobuf, then re-install TensorFlow ensuring that it’s >= 1.0. I was installing a CPU only version of Tensorflow on Ubuntu 16.04, Python 3.5 running on Virtual Box using the tutorial and I got the following error. tensorflow-1.0.1-cp35-cp35m-linux_x86_64.whl is not a supported wheel on this platform. It’s hard to say what the exact issue is. Make sure you are copying and pasting the full TensorFlow URL correctly. in order to use Tensorflow 1.0.1 (python 3.5, GPU-enabled). In other case, you will install a previous version (0.11 in this post). This is recommended to use the latest API and avoid conflicts. How do I install Tensor Flow on my Ubuntu 15.04 32 bit system ,using pip always show error? What is the error message you are receiving? Without knowing the error, it’s impossible to diagnose the problem. Thanks Adrian Rosebrock. I just followed the steps and its working fine. I think “image_data_format”: “channels_last” is also correct in addition to the “image_data_format”: “tf”. You can use image_data_format as either channels_last or channels_first with Keras 2.0. The difference is that channels_last is faster with TensorFlow and channels_first is faster with Theano. Great blog and thanks for sharing these info. I have create my virtualenv keras with tensorflow backend with python; when i am trying to use matplotlib I have a problem because it does not work with virtual environment. Do you have any suggestion how to solve this issue? Hi Alessandro — are you getting an error when trying to use matplotlib from the virtual environment? Hi Adrian. Is it possible to install Keras+TensorFlow in my Raspberry Pi 3 (raspbian)? Yes. I would actually suggest following my Deep learning + Ubuntu tutorial. Since both Ubuntu and Raspbian are Debian-based you can use the same instructions. can no longer be set to tf, rather one should leave it (or change it) as channels_last like the below, which is actually default it seems. You’re absolutely right, for the TensorFlow backend in new versions of Keras the image_data_format should now be channels_last. Do I need to repeat the whole process of pip install for every virtual environment that i will create? Correct, you would need to repeat the pip install process for each new Python virtual environment that you create. 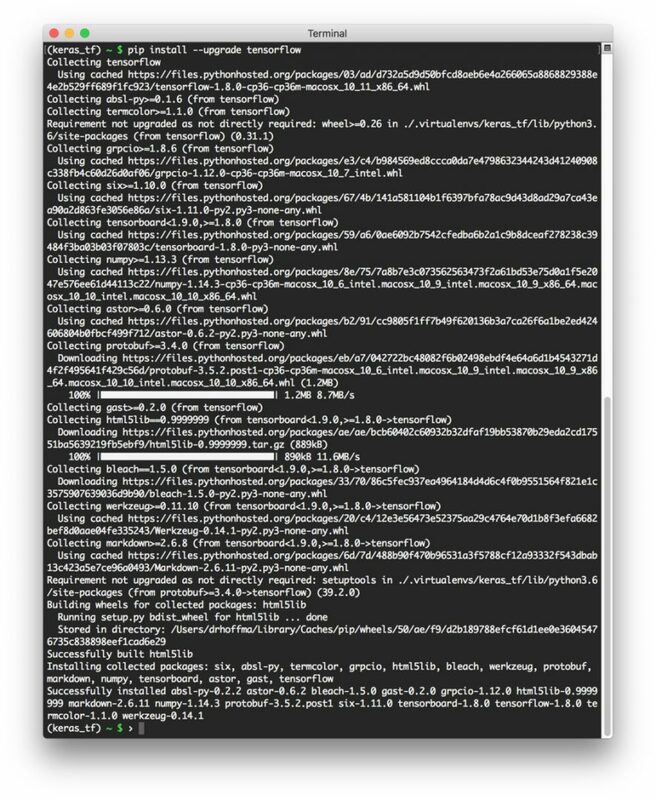 I think I’ve successfully got Keras installed by installing from the official keras repo on github. However, I’ve run into another problem where my openCV2 bindings are not being recognized within my keras_tf virtual environment. 2. Your “cv2.so” sym-link from the “keras_tf” virtual environment points to a file that does not exist. Double-check that file path. Just wanted to let you know that I followed your instructions for Tensorflow installation, which failed with cryptic errors. I found that the latest version of Tensorflow will not run on my (older) desktop CPU, a Core 2 Quad Q9650. When I forced the installation of (the older) v1.5 of Tensorflow, everything worked. In any case, my reading list is full, and thanks for your efforts. Hey Charlie — which version of Python + TensorFlow did you originally try to install? Thanks for sharing that downgrading to v1.5 fixed the issue. I’ll also get that typo updated. Thank you for picking up a copy of the Starter Bundle, I hope you are enjoying it so far! I know this tutorial has been created for more than 2 years. I just wanted to know do you have any tutorial instructing how to deal with problem of Python 3.7.0? I did a search and realised that Tensorflow has not supported this version yet. When I followed your tutorial (https://www.pyimagesearch.com/2016/12/05/macos-install-opencv-3-and-python-3-5/), the version of 3.7.0 was already installed on my computer. So, is that right if we only have one option to run with Tensorflow: install python 3.6 or lower? If it is, do you have any tutorial demonstrating how to install two versions of Python on the same computer? I’m publishing a brand new post on installing Keras + TensorFlow on macOS Mojave tomorrow. This post will also show you how to use Python 3.6 instead. Keep an eye out for it! Great news! Thanks a lots. Thanks Aniruth, I’m glad it helped you! Very clear and great work! I want to install Keras on my Raspberry pi 3 b+, where the python version is 3.5.4 but keras installation is with 3.6. Whether I have to upgrade python to 3.6? Keras can work with Python 3.5. Are you saying you want to use Python 3.6 instead? in raspberry pi 3 b+ I got errors like version of python not matching and ration is not matching. What to do? Please help me. Can you be a bit more specific? What versions of Keras and TensorFlow did you install on your Pi? What are your specific error messages?